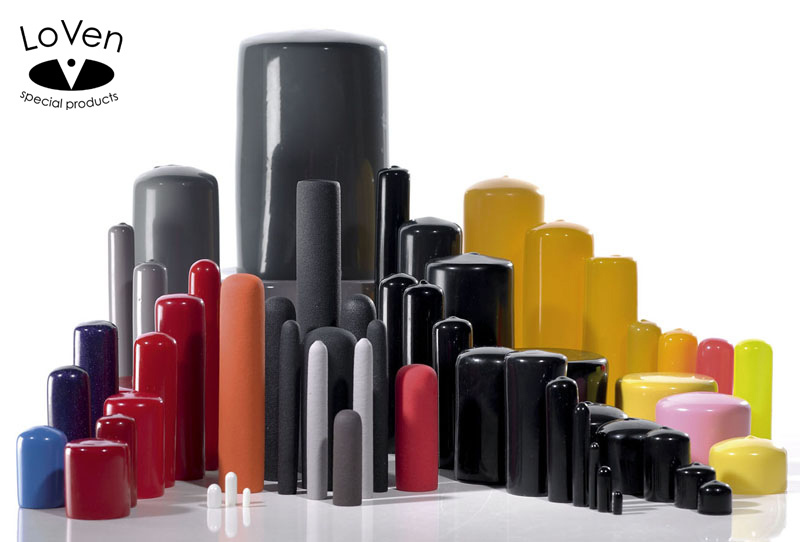 As Europe’s market leader in dip molded vinyl products, LoVen offers a wide range of standard vinyl end caps. These caps can be used on tubes, pipes, bars, fittings, and bolts. Examples of suitable applications for vinyl end caps are paint masking, thread protection, electroplating, and protection against dust and other particles. Our end caps come in many different sizes and colors. When we don’t have a standard cap available for your specific needs, we can develop a custom mold to your exact specifications and in a color of your choice. Furthermore, LoVen is an expert in the development of custom dip molding material. This means that we can produce your vinyl end caps with special features like UV-protection, oil resistance, chemical resistance, and resistance against high- or low temperatures. Vinyl end caps have many advantages over hard plastic and PVC end caps. The main advantage of vinyl is its flexibility. The flexibility of vinyl caps ensures an optimal seal between the cap and the application surface and withholds the caps from cracking under stress. Furthermore, flexible vinyl end caps are easy to install and stay in place once they are installed. Our caps won’t shred and therefore won’t leave residue in case of threaded application. At LoVen we are specialist in dip molded products that come in many shapes, sizes, colors, and with many different outstanding qualities. We can advise you with regards to products that will suit your specific needs. We even can design and produce end caps to your exact specifications. Feel free to contact us with your questions about vinyl end caps or to receive a free sample of our products.